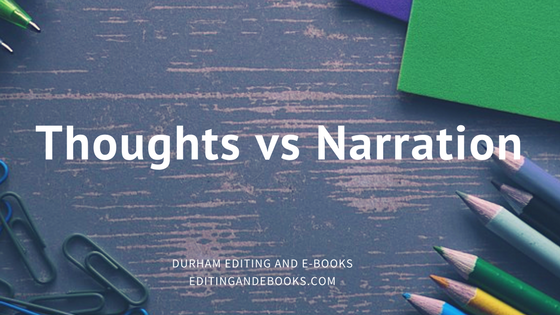 One thing that we run across very often when editing is when writers use thoughts as narration. It is not that they didn’t format them correctly, but they allowed too much of the internal thought process of the character to act as what the narrator might say. This is an easy thing for writers to do since they are so involved in the story that they may not realize they are crossing that line. We see that all time. Bob was running as fast as he could to escape the giant dragon that was hot on his tail. What a crazy day! It had all started with a trip to the grocery store, and here he was being chased by a dragon. In these sentences, the last two are actually too subjective to be an omniscient third-person narrator (the last not as objective because it is linked to the second one because it explains why it was a crazy day). Instead, they talk directly to the reader from the narrator’s point-of-view (even though these are really things that Bob is thinking), and that can detract from the narrator’s credibility as an objective outsider. You see, these are really things Bob is thinking. They aren’t actual narration of the story. It is a fine line, but a series of little things like this can change the tone of a piece, the credibility of the narrator as objective, and even the actual point-of-view the story is being told in. There are a couple ways you can change this. Bob was running as fast as he could to escape the giant dragon that was hot on his tail. What a crazy day! It all started with a trip to the grocery store, and here I am being chased by a dragon! While this works, too many direct thoughts are disruptive to the narrative flow of a story. Each time the reader switches gear from the third-person narration to a first-person thought causes a tiny glitch in the narration. The more glitches, the more the narration seems a bit broken. As such, it is better to keep direct thoughts to a minimum. You do not have to eliminate them altogether because they can serve a purpose, but it is a good idea to use them sparingly, kind of the way you would use spices in a recipe. Think About It: If you add too much salt to something, it is not always as easy to eat. Bob was running as fast as he could to escape the giant dragon that was hot on his tail. He couldn’t believe what a crazy day it had been. It had all started with a trip to the grocery store, and here he was being chased by a dragon. See how the last sentence now fits as part of the narration because the reader understands that this is what Bob is thinking? It’s a small change, but it makes a big difference because now the narrator stays as a third-person, objective narrator and simply uses that perspective to the fullest. As you write, the best way to spot places like this is try and remind yourself that the narrator should not have feelings about what is going on in the novel. The narrator should stay as objective as possible. Always take a break between writing and revising. We suggest at least two weeks off to help you get some distance from the piece and see things more objectively. Always revise your work for large errors on the first run-through after you write and don’t focus on little things. Nail down the big stuff and then worry about the more technical stuff. Read your work out loud as you self-edit. This will help you hear when emotion occurs in the story, and it will help you spot it easier. Also be sure to look for things like exclamation marks, as those are often a good clue that things are not as objective as they should be.